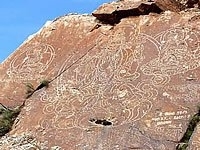 Tour route provides you a great opportunity to not only to enjoy the beautiful natural landscapes of Almaty region, but also see the one of the unique monuments of the past – Tamgaly Petroglyphs – one of the oldest and most striking monuments of rock art of Zhetisu, which is protected by UNESCO since 2004. Tamgaly Gorge located 170 km north-west of Almaty city. This is virtually an ancient art gallery, where there are depicted individual animals and people as well as the whole scenes from the life of ancient people. The total number of drawings in the main gorge is about 2,000. There are images of solar deities, clowns, soldiers, married couples, pregnant women, multi-figure compositions and scenes of hunting and sacrifice. Most of the petroglyphs date back to the Bronze Age. For centuries the rocks of this canyon and narrow valley of Tamgaly retained value of the sanctuary, the place where ritual ceremonies were held, magic rituals were performed, worship of the gods and the spirits of ancestors took place. 25% Cancellation Fee (75% reimbursement): 45 days prior to date of activity. 50% Cancellation Fee (50% reimbursement): between 16 to 44 days prior to date of activity. 100% Cancellation Fee (no reimbursement): 15 days or less prior to date of activity.